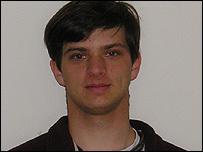 Nikolas Macko was in class at Virginia Tech when a gunman entered the building and started shooting. He described the experience to the BBC News website. 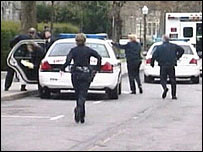 I was in class in Norris Hall at around 0940 when we heard a series of loud bangs coming from the hallway. The sound did not register immediately, even though it was startlingly loud. When it started again seconds later, the girl sitting by the door decided to close the door. She peeked out into the hallway, and saw the shooter, so she immediately closed the door shut. Three other students moved a table that was in front of the room and barricaded it against the door. A few seconds later, the shooter tried to open the door, but my classmates kept it well shut, as they held the table against it. The shooter shot the door twice at chest level, which resulted in two holes in the door, one of which hit the podium in the front of the classroom and the other continued out the window. At this point he reloaded, shot the door again - this shot did not penetrate - and moved on to the other classrooms. Thankfully, nobody in our room was hurt. At this point, I was already on the phone with the emergency dispatcher, indicating to them that there was a shooting on the second floor of Norris Hall. The shooting continued for several minutes, until the police arrived, and the shooter must have shot at least 80-100 rounds. As we heard the police arrive outside the building, the shooting continued, and the officers eventually came through the building. Even though it seemed to take quite a long time, the timer on my phone seemed to indicate that the whole sequence of events was over in only 25 minutes. At that point, we were escorted from the building by the police. Clearly someone had been seriously hurt in the hallway not more than a few paces from our classroom. I did not look in the adjoining classrooms, but those who did simply told me after that "it was sad".